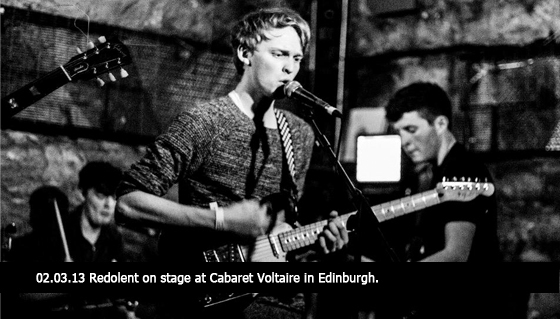 Being Redolent’s debut gig this was the first time I, or anyone else for that matter, had seen them perform in a live venue. However, you would be mistaken for thinking that they have been performing together on stage for months as they turned in a solid and thoroughly entertaining performance. 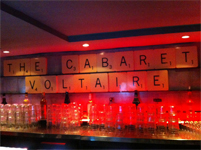 Taking place in one of Edinburgh’s best known and loved venues, Cabaret Voltaire provided an intimate and not too intimidating arena for the band to debut their tracks to the audience. Great vocals from the singer mixed well with their blend of intricate guitar picking and interesting and changing rhythms. A mix of solid bass playing and driving drums provided a great platform for the guitars to shine through and take centre stage on the tracks. The bands use of dynamics created interesting changes in the songs and kept the audience on their toes. Full of nervous energy at the beginning, the band seemed to relax into the gig very quickly and throughout the show they had a great command of the stage. They did not just play through their set but gave a performance that was entertaining, well executed and most importantly full of good songs. Due to a couple of small technical difficulties the sound was a little muddy at times, although this was nothing major and did not take away from the performance of the band. All in all Redolent’s debut gig was a triumph, with the band showing great potential and promise for the future, whilst looking like a band that has already worked out how to perform well with each other. Have a listen to the demo of their track “Useless”. Its another great tune which has, for some reason, a picture of a redhead lying on the grass to go with it. Go figure!.